The holidays are right around the corner!! Even though it is cold, it’s such a fun time of year and there are so many fun activities going on! 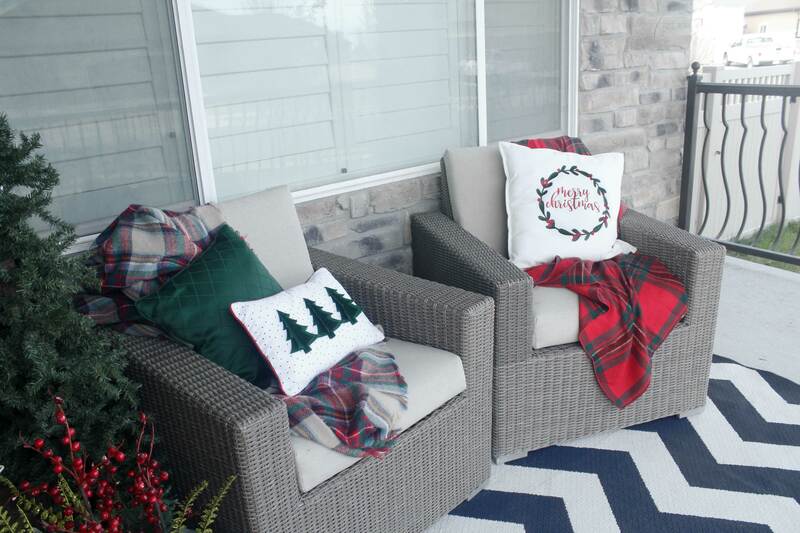 One of the best thing about the holidays is the decorating. I love decorating and especially for Christmas. 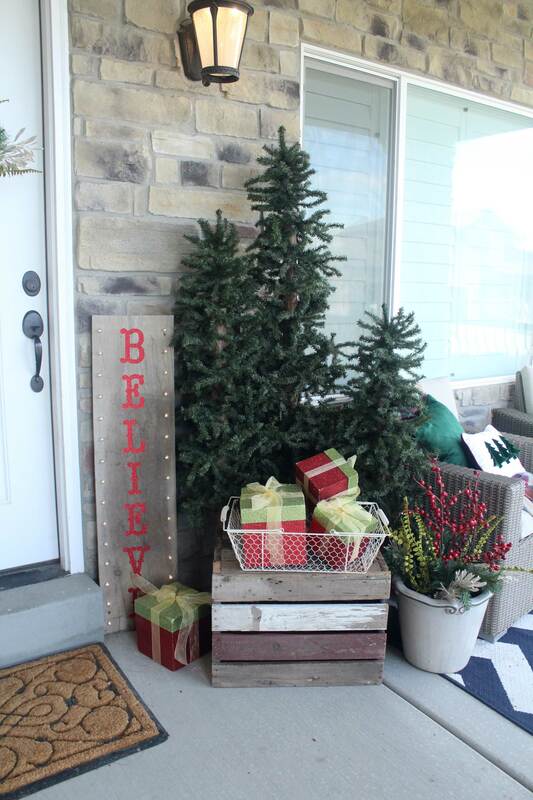 This year I wanted to spruce up the front porch. I had the idea for a big sign, and some pillows and I have created the tutorials for you here!! Read on to get step by step instructions. I recently searched KSL classifieds and found some outdoor Christmas trees for only $15 for 3 of them !!!! 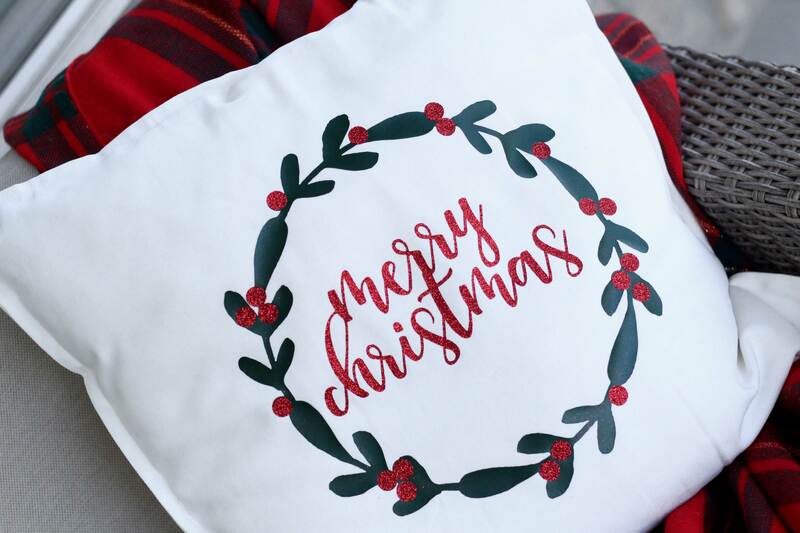 KSL, Deseret Industries and other thrift stores are great places to find holiday decor. They usually have a large selection at this time of year in the seasonal section. Since the release of the new Cricut Maker, the possibilities are endless. I have made custom pillows in the past but most of the time it is with the Cricut Iron on material. I wanted to do something with fabric this time. 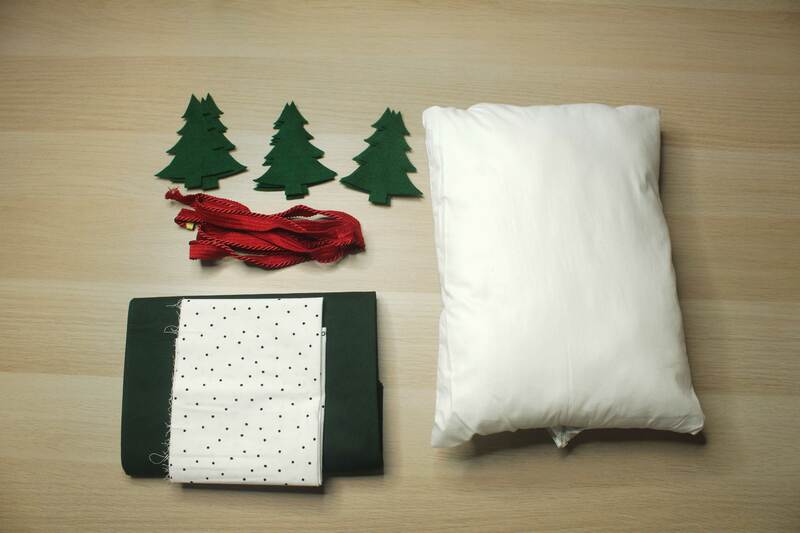 Let’s start with the 3D felt tree pillow. In Design Space search images for trees. Adjust size to what you want according to the pillow size your using. I made mine about 4×5. Duplicate it 4 times. Choose 3 copies of the project before cutting. 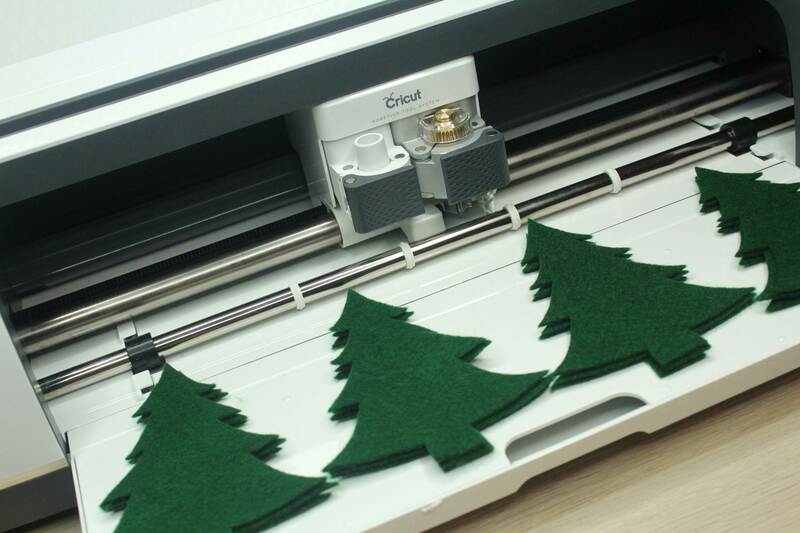 Place felt on the fabric mat, and load into the Cricut Maker Machine. Choose Material and press make it . It is so cool to see how amazing the Maker cuts fabric!! The rotary blade is incredible! For the back of the pillow, you will need 2 pieces of fabric. Cut 1 piece the same size as the front and fold back. Cut another one that is smaller about 1/3 of the pillow. You are creating an overlapped pocket on the back so you can slip the pillow in and out as needed. 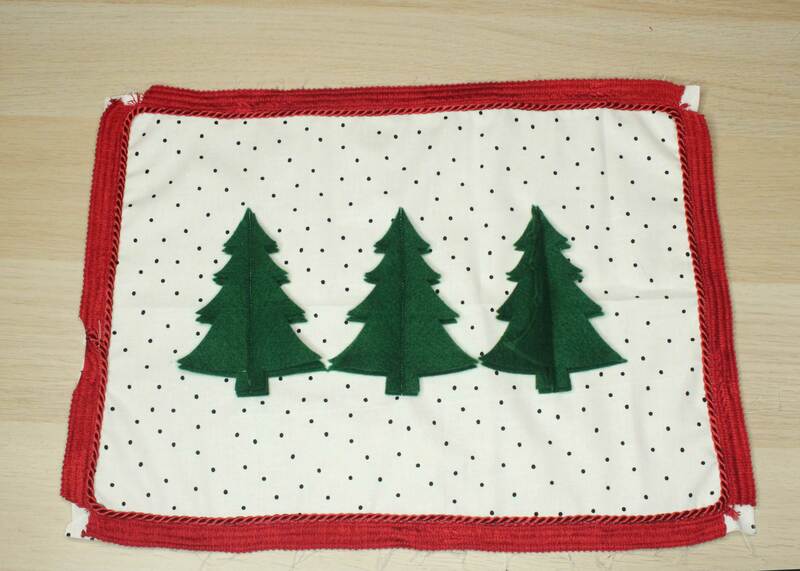 Once all your fabric is cut, place the trees 3 layers high on the polka dot fabric. Arrange them how you want and 3 layers high. Pin them in the Centers to the fabric. 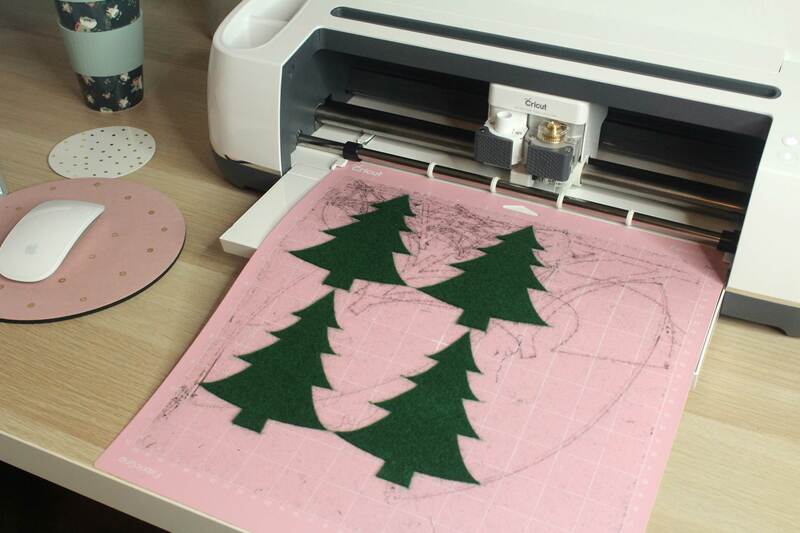 Using the Cricut washable Fabric Pen and a ruler, draw a straight line down the center of the tree. This will be your stitching line. Stitch all 3 layers down along your line. Continue for all 3 trees. Now it’s time to put the pillow together. I wanted to add some trim to this pillow. That will be the first thing we need to start with. I like to use a #30 foot for my Bernina machine. I think its called a piping foot. This foot helps get ta perfect and tight piping. Place your piping in the center of one of the sides. This will make the start and stop parts less noticeable. Withe piping foot in place, put it right on top of the piping you are adding. Sew all the way down to the corner and the clip the piping material. This will give you more space to make the turn. When you make it all the way back around, over lap the edges. Place the backing material right sides together and pin. since you are making that pocket, make sure to fold on edge of each piece down and pin in place. After you have it pinned all the way around, turn over both pieces and stitch on the same line that you stitched the piping on the first time. This will ensure a very nice close fit. Turn your pillow cover right side out. Now it’s time to make the trees 3D take some tacky glue and place on one side of the top tree. fold it in half and hold in place for a few minutes until it dries. Fluff up the second layer of trees. I love the Dimension of this pillow it is so fun! 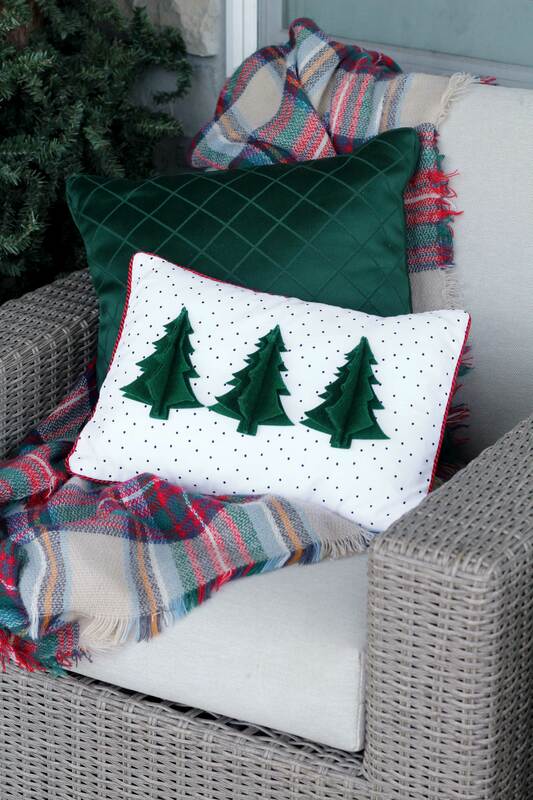 The Cricut maker cut the trees so fast and perfect and made this cute pillow possible. 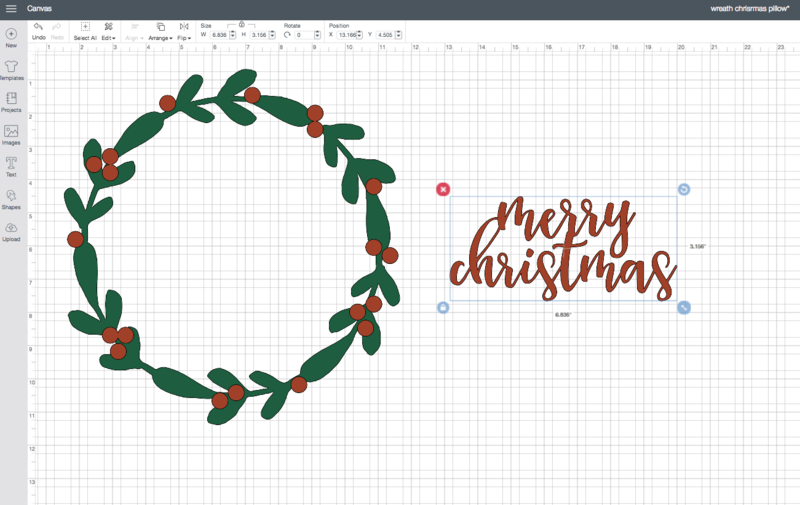 Open Cricut Design space and find the following 2 images. Search Wreath for the first one and Marry Christmas for the words. All these images are Cricut images. Place the Merry Christmas in the Center of the Wreath. Ungroup the Wreath. Select the berries and the Merry Christmas words and attach them together. This will ensure that your Merry Christmas words will be placed right in the center where you want them. Click make it on your Cricut Maker. 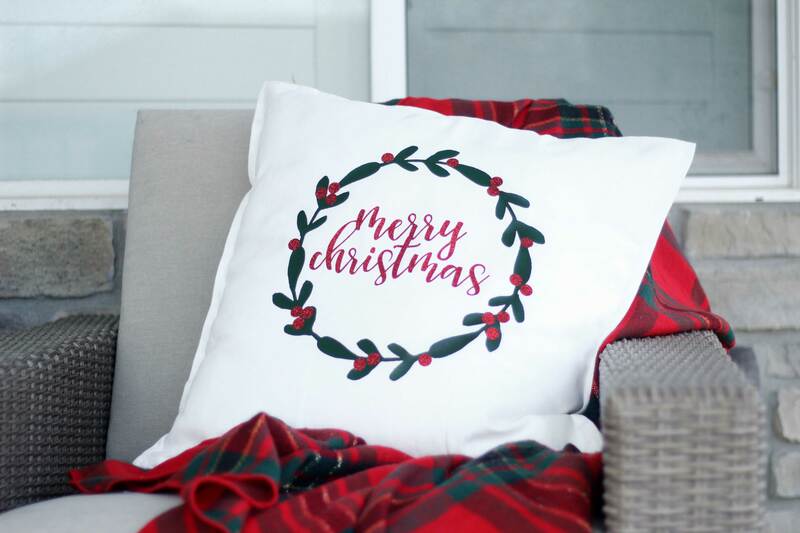 Using the Cricut EasyPress, Iron on the wreath one section at a time. Starting with the bottom layer, the green leaves. Add the Top layer of berries and the Merry christmas words. Your done!! How fast and easy was that?! Heidi swapp marquee light bulb strands. I found this awesome piece of weathered wood out in my Dad’s wood working shop. He has all sorts of sizes of wood and i was so excited to find this perfect piece!! I wanted the sign to say, BELIEVE. 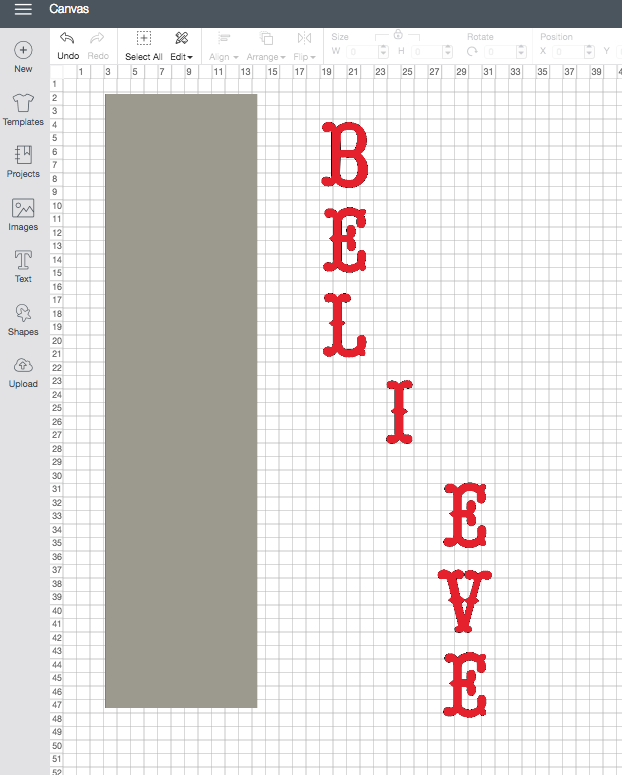 In Cricut Design Space, choose a font and type out BELIEVE. 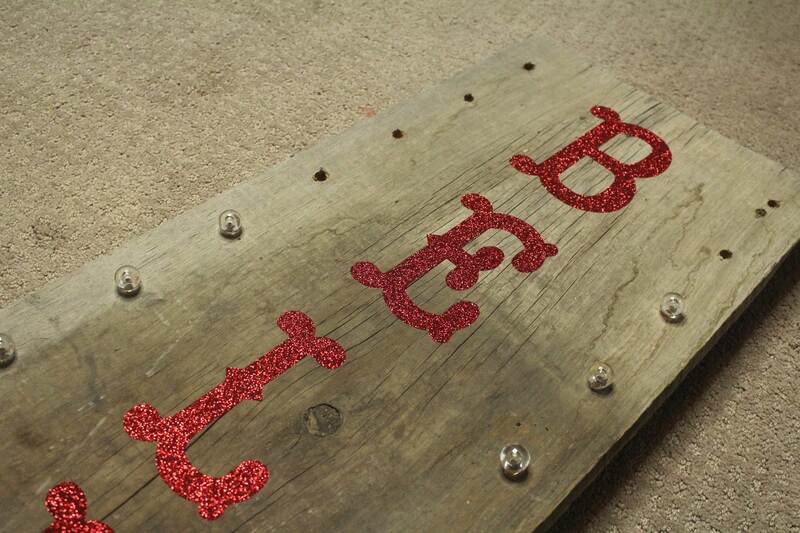 Measure your board and figure out what size you need your letters. My sign was larger the 24″ so I had to separate the letters for cutting. The Glitter iron on is very hard to see after it has been cut. I love to use the Cricut BrightPad for all my weeding. It makes the job so much easier!! Here is an example of how the BrightPad works. 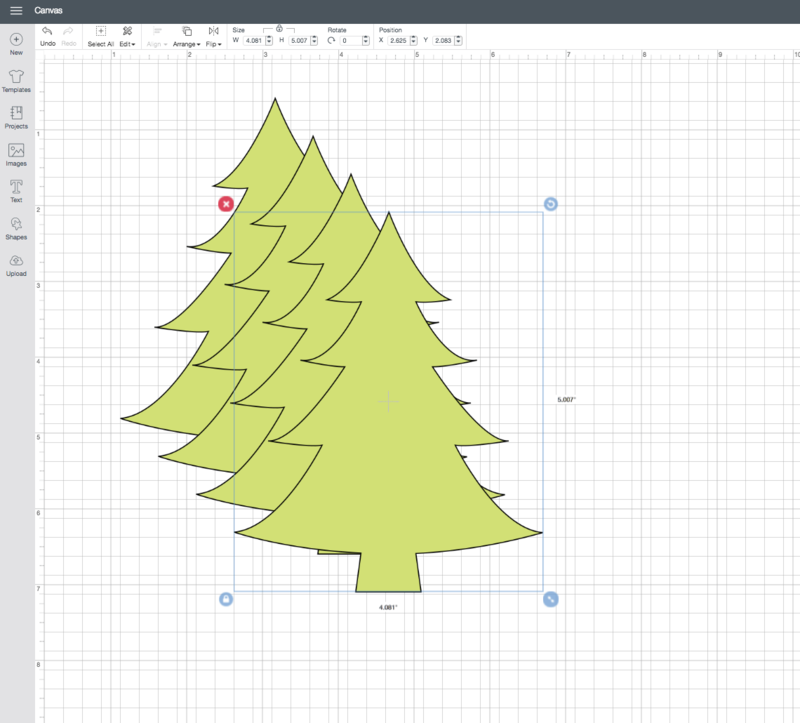 When the Cricut BrightPad is on, you can clearly see the cut lines and where you need to weed the image. Lets prepare the board. Measure the board and decide the distance between your lights. (*CHECK THE LIGHT STRAND FOR THE DISTANCE CENTER TO CENTER IN BETWEEN EACH LIGHT) I learned the hard way about the distance between bulbs. I just placed the bulbs where I wanted which was 3″ apart. The light strand wouldn’t reach that far in between each on, so I had to skip every other light. So…Check the strand for distance!! Determine the right Distance and mark the board for drill holes. 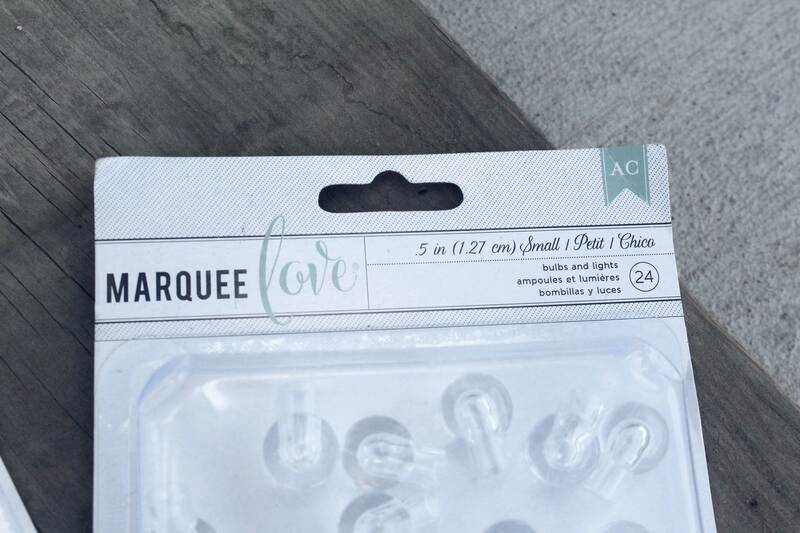 Using a 5/16′ Drill bit, Drill the holes for the marquee lights. 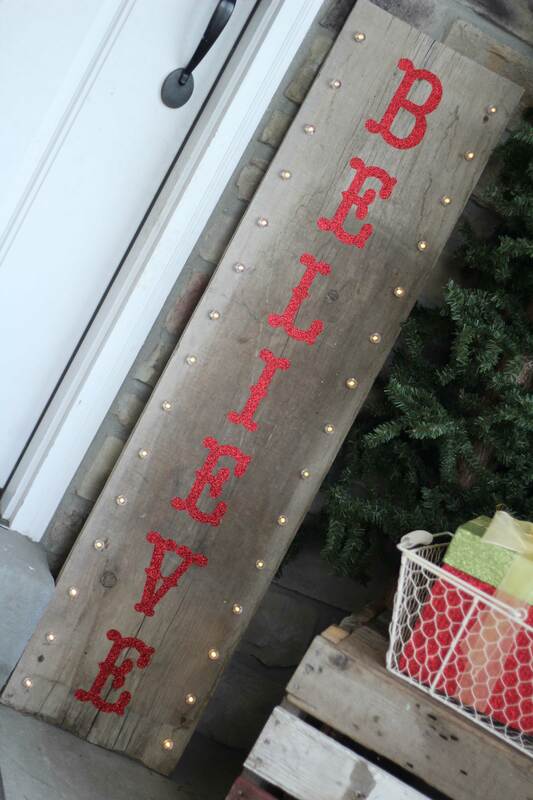 Before putting in the lightbulbs, you will now need to iron-on the word BELIEVE. I love that you can iron-on to wood. Vinyl doesn’t stick to wood very well so this is a cool way to do it!! Place your letters on the board where you want the. 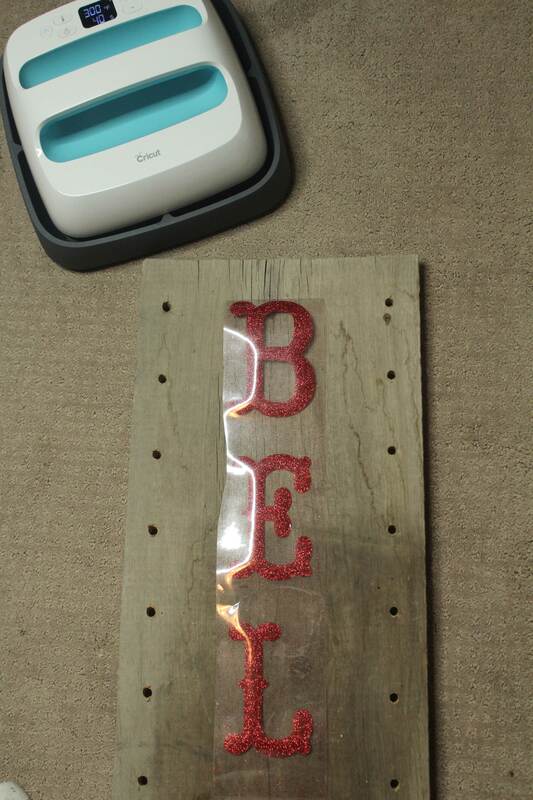 Using the Cricut EasyPress at 340 degrees for 40 seconds in each location, attach the letters. 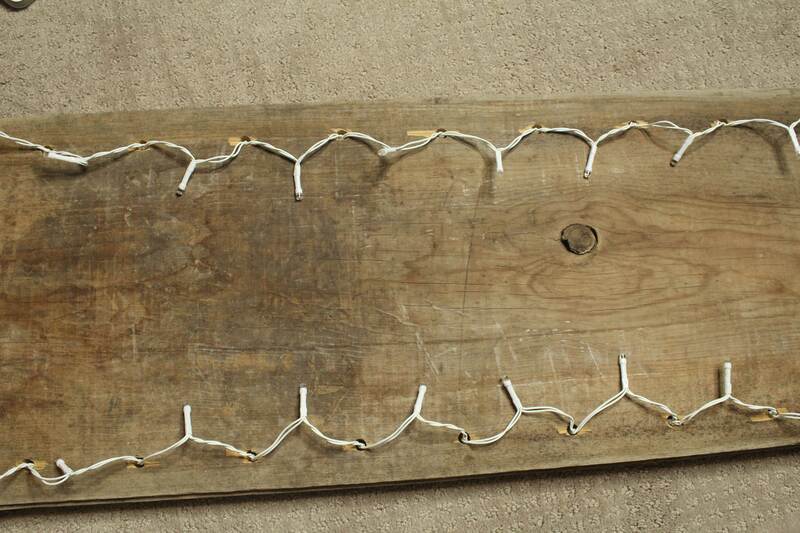 Put the Light bulbs in and press the light strand in from the back side. 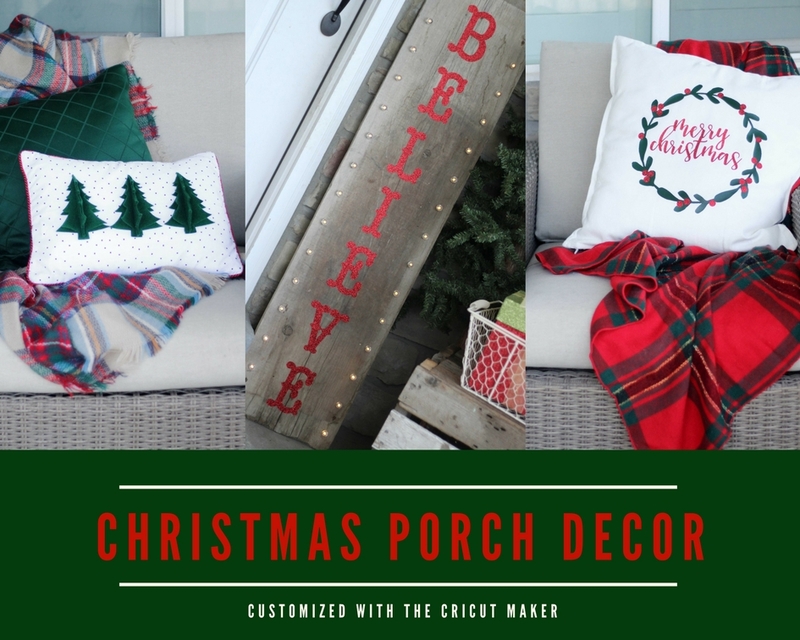 The Cricut Maker and the Cricut EasyPress made all these projects come together so quickly! I absolutely love my machine and can’t wait to do more projects!! I hope you liked these tutorials! Please leave any questions that you have below! Thanks for stopping by!! Want to win your very own Maker machine??? Next ArticleCRICUT CYBER MONDAY SALE EXTENDED!!!! !